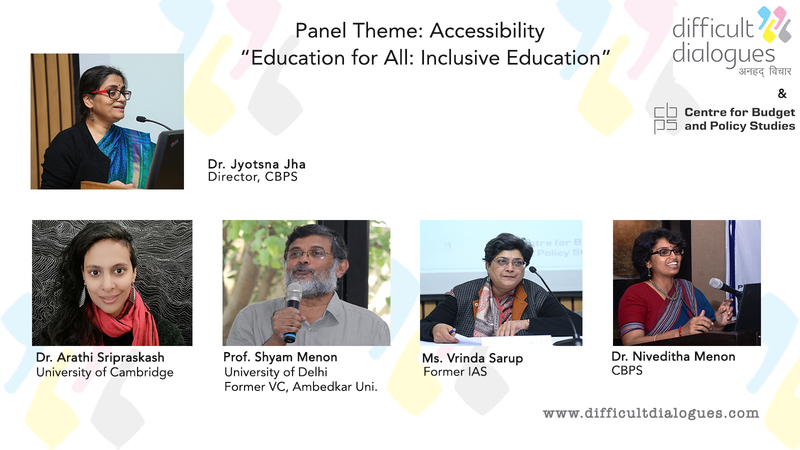 CBPS along with Difficult Dialogues is organising a panel titled, ‘Education for All: Inclusion in Education’ on 1 February 2019 at Abolim Hall, International Centre Goa (ICG). The panel consists of Dr. Arathi Sriprakash (University of Cambridge), Prof. Shyam Menon (University of Delhi; Former VC of Ambedkar University), Ms. Vrinda Sarup (Former IAS) and Dr. Niveditha Menon (Senior Research Advisor, CBPS). The moderator of the session is Dr. Jyotsna Jha (Director, CBPS) and the rapporteur is Ms. Neha Ghatak (Research Advisor, CBPS). The panel description and the bios are available here. The programme schedule can be viewed here.